Tell them you found it on anvilfire.com! Blacksmithing and metalworking questions answered. Almost every blacksmith either starts on a homemade anvil, plays with making RR-rail anvils or has thought about making anvils. Here are a few. 17 year old Canadian makes this solid steel fabricated anvil with hardened face. Includes CAD drawings, photos and video links. Details . . .
Ray Davis' "Mile Long Anvil"
This solid steel fabricated anvil weighs 5280 pounds (the feet in a mile) and thus was dubbed the "mile long" anvil. Details . . . Huge English Double Horn Style Anvil Details . 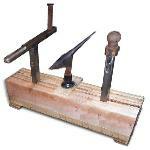 . .
Italian style fabricated anvil. Details . . .
Two anvils made by Daniel Boettger of Canada. A Medieval Pentagonal and late German style. A collection of photos of various RR-rail anvils. Detail . . .
By Justin Naylor. Detail . . .
A classic farm and welding shop DIY anvil. Details . . .
by Daniel Gillund Details . . .
Index to Anvil Making Articles How to fabricate anvils, ideas, designs and examples. Square Holes and Bolsters iForge How to make hardie holes in solid. 3 Hardie Holes Fabricated hardie holes for DIY anvils. 3 MORE Hardie Holes More ways to make hardie holes for DIY anvils. anvilfire Gallery of Anvils and Stakes Virtual museum of over 250 anvils and stakes. Selecting an Anvil Which is right for you? Finding Anvils Anywhere in the World How "finders" find anything. German Anvils Comparison of types early and modern. ASO's on ebay Dealer Fraud - avoiding getting stung.